Can you see how it has been made? Why is the 60 in that particular square? Why does 20 appear twice? In the interactivity below, some of the grid is filled in for you. 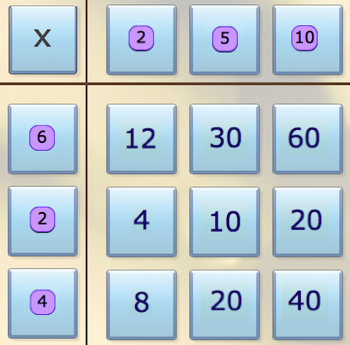 Can you work out which number goes in each row and column heading? Once you know what each heading must be, drag the purple numbers to the appropriate spaces. When you think you have cracked it, click "Show the solution" to see if you are right. Trial and improvement. Calculators. Multiplication & division. Interactivities. Place value. Odd and even numbers. Factors and multiples. Working systematically. Investigations. Addition & subtraction.